← What is Charity?- It isn’t what you have been told! It’s Tzedekah. 1 Cor 13. Posted on February 19, 2013, in Bible Figures, Christian Paganism, Messianic Movement and tagged Easter, Esther, Purim, Vashti. Bookmark the permalink. 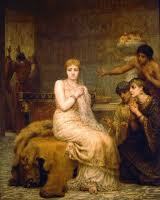 Comments Off on Queen Vashti- The First Feminist in the Bible. Esther Chap 1.